Hi, we’re Josh Kaufman and Justin Rubenstein - brothers and founders of a gypsy-folk band called THE BLASTING COMPANY. We started out as a street band in Nashville and eventually made our way to Los Angeles. We’re best known for our scoring/songwriting work on the Emmy-winning Cartoon Network mini-series OVER THE GARDEN WALL. The score was loved by fans, prompting Mondo Records to release the first ever vinyl soundtrack of a Cartoon Network show. Our latest project is the animated series COSTUME QUEST, recently premiered on Amazon Prime and is now available for streaming. We've loved working on this series, as it has allowed us to reconnect with the rock, synth and country music that we really enjoyed as teenagers. Expect our second studio album later this year! For now, we’re happy and excited to answer any questions you have about our music. Thanks! It's become a tradition in my house to binge all of OTGW the Sunday morning before Halloween. We love it! So we need to know... how did you come up with the combination of potatoes and molasses?? First off, that is so cool that y'all do that. We have a family thing of watching Twilight Zone every new year and Josh's kids watch OTGW every halloween, as well. Under duress. But no, to answer your question, we didn't come up with that combination. That song was written by David Stevenson, one of the board artists on the show. Did you guys sing the songs? We sang on just a couple of them: Old Black Train and Send Me a Peach (which I think only had our backup vocals in the show). Oh! And we also did the backup vocals on The Beast is Out There in Episode 4 and the frog voices on Over the Garden Wall in Episode 6. Oh right, Josh is reminding me that we did backups for Patrick McHale's lead vocals on The Fight is Over in Episode 9. Mostly, though, the songs were sung by folks who were voicing the characters. Chris Isaak, Jack Jones, Sam Raimi, Elijah Wood, Shannyn Sossamon, Shirley Jones, Deborah Voigt, Eddika Organista , Frank Fairfield & Blind Boy Paxton. That was the funnest part for us, was writing songs for those people specifically. Why didn’t you release OTGW soundtrack digitally? (Itunes, Spotify...) I would buy the heck out of it! My Question is: What are your favorite OTGW songs and why? Also what are your favorite songs you've ever worked on? Thank you so much for sharing this with us. I don't know if there's a word that expresses the feeling of honor and humility and connection that we feel having had something to do with lightening the load of that unfathomably difficult process in your life. I mean, we both suffer from depressive episodes too (I think I (Justin) was in one almost the entire time working on OTGW, nothing to do with the production, just, you know) and music has always connected us to some shred of light, something generative to guide us through. Never would we have thought that we'd be a part of something that could do that for somebody else. So, thank you again for sharing that and we're so happy to know you've gotten through it. This question has ignited a really good discussion among us here and I'm pretty sure this answer is about to get really long. Ok, here goes. The Beast is Out There is definitely one of our favorites because of the recording process. The vocal was already recorded but other than that we had no idea of a plan for how to accompany it. It was a super super hot summer in LA and we hadn't installed AC yet in our studio, so we just had a ceiling fan, which we couldn't use while we recorded. That day we were all just sitting around shirtless and miserable in pools of sweat. At some point we saw some of the tavern folks had their mouths open and we were like, ooh it looks like they're kind of going "aaah," like some kind of creepy man-choir. So we stood around the mic trying to get the biggest vibrato we could: shirtless, sweating, Josh bouncing his belly around, sounding and looking like a bunch of creepy cultists, wondering if we'll ever make it big enough to have AC. Our other less long-winded favorites are Tiny Star, The Journey Begins/Half-Moon River, Off to Bed, Send Me a Peach, Patient is the Night. Ms. Langtrees Lament may have been the most fun to write, that and A Courting Song. As for our own music, we recently recorded a new song, Candy, which was really fun to work on, as we had a little orchestra of 10 or so of our favorite musician people in LA come and work on it with us. Just sitting in the studio with all of those old friends, some of whom we've never worked with, just love, felt like the culmination of something. Felt like what the absurdity of creating stuff is really all about: community. The whole first album was an amazing moment in time for us so it's hard to pick a song, but I'd say Madame Selma captured everything the best. We recorded it in a studio and invited a bunch of friends to come, kind of treating it like a live show. Got snacks and drinks and everyone just set down somewhere, while we played. Specifically Madame Selma was emblematic because, listening to it, we can hear faintly in the background the whoops and gritos of our friends, the whoosh of ambient energy as the song picks up and I guess, it feels like that's what the song was intended to do and we did it and it just always transports us back to those days, when we were chasing that moment at every show and on every street corner. That whoosh. Oh! We just remembered another favorite recording. Not exactly a song, but the For Sara tape of poetry and clarinet was way too fun. Pat and I (Justin) and one Pat's friends dug up a bunch of our old poems from middle and high school and wrote a couple of new ones in that vein and Elijah came over to the studio and recited them as earnestly as only he knows how. It was so many levels of embarrassment and ridiculousness, dragging our poor 14 year old feelings back to life through Elijah Wood, but it was so much fun. Then Josh recorded all the clarinet parts, using two cassette tape players and then we played around the studio to get sounds like Greg opening the door on Wirt all of a sudden. It was all like doing a little radio play. That's got to be the silliest recording we've done to date. Hi! I'm a huge fan who originally found out about you all from Over the Garden Wall. You've inspired many pieces I've written and continue to write. How do you come up with such catchy melodies and harmonies? I'm amazed when listening to the OTGW soundtrack how I was still humming along to the tunes after not hearing them for around a year and a half. I'd have to say Prelude is my favorite piece from the soundtrack, such a soothing piece. Who are your biggest influences? Who would you recommend to listen to to someone who wants to delve further into the kind of music you guys write? Do you have your sheet music online anywhere? I'd love to analyze your pieces more if I could without having to rely on possibly wrong fan transcriptions. Thank you for all the good memories and warm feelings, you harmonic geniuses, you! Hello! We would love to hear the music you've been writing if you wouldn't mind sharing. There is a list here! Though since it seems like you might be a harmony nerd like us, I would particularly recommend Chopin (duh) and Willie the Lion Smith (Duke Ellington's piano teacher). There is some that came with the vinyl record which is the most accurate (especially for Into the Unknown which is often played somewhat differently than we wrote it) but not that much. Which pieces are you hoping to look at? Perhaps we have some laying around here somewhere! I guess one of the major reasons people get into making music is to try and move people in a way that you yourself are moved by music, so it is extremely heartening to hear that you felt some of the feelings we were hoping to share. Thank you so much for that. Are there any shows you would recommend purely for the soundtrack? What are your aspirations for future projects? Dang that's a really good question. I (Justin here) think Fargo on FX has a really impressive soundtrack. That's been one to recently stand out big time for me. Stranger Things also has an excellent soundtrack. Josh quite fancies Avatar: The Last Airbender. We both agree Batman: The Animated Series was pretty special. Oh! Twilight Zone I mean, that's one of the greatest. And Looney Tunes. Charlie Brown. And now Josh is on a nostalgia kick going through cartoons he liked. Hey Arnold. Courage the Cowardly Dog. Animaniacs. Oh! Atlanta on FX. But I think now I'm just recommending good TV shows. We'd love to do a feature film. More immediately we're trying to release some more original music. In fact, we're working on our first animated music video, so that's been really exciting. Can't wait to release that. But yeah, broadly speaking, I think we both really enjoy this marriage of music to moving picture and aspire to keep getting better at it. I would LOVE to hear you guys do your own versions of the songs from OTGW (sort of “acoustic” jams). How do you write songs with other singers or musicians in mind? Also, what are you working on now? We've done it a few times at live concerts, but yeah, maybe we should try recording it sometime! We've been loving hearing other folks' interpretations on YouTube and Soundcloud and the like. That's a really good question about writing with other folks in mind. I guess, in a way, you kind of end up writing in character. Like with Jack Jones and Chris Isaak I distinctly remember doing impressions of their voices while coming up with the melodies and lyrics, just to see if it felt right. I mean, we also got a note from Jack Jones that we had written some things that felt a little overly croony to him. And then with the schoolteacher in Ep 3 and the toymaker in ep 4, we know them personally, so that felt even easier. Actually, Frank Fairfield helped us write The Courting Song, which he sings in ep 4. As for what we're working on now. We're working on Costume Quest, which just aired the first half of its season on Amazon Prime. We're also working on some new originals and our own fan fiction album for OTGW of the synth-pop band featured in the party in Episode 9. We had so much fun making that song with our friend Eddika Organista that we decided to try to make a whole album. Have you guys ever eaten potatoes and molasses? During our "For Sara" tape recording session with Elijah Wood we snacked on roasted fingerlings drizzled with molasses and salt. Not bad, but potatoes so rarely need sweetening, ya know? What's your favourite rock fact? Big fan of yours, truly. I have the soundtrack for OTGW on vinyl and love it to death. You were even in my top 5 bands on my spotify yearly summary (Old Black Train was a top 5 song)! I love the sound you have as it is beautiful and very unique by todays standards, it even shines in Costume Quest too. Is there any chance you would consider touring the country? The music you make seems like it would be even better in person and I'd die a happy man being able to have that experience. Geez don't die!! That is so kind of you to say. We would absolutely love to tour the country. We've talked to some folks on the west coast about setting up concerts of OTGW, but had to table that discussion while we worked on the season of Costume Quest. I reckon the only other hindrance is just the difficulty of booking tours. We used to do it all the time when we would just set up on any old walked-on street and start busking. But so yes, we most definitely would, if we can figure out the logistics and all that. What was your inspiration for the music in over the garden wall? What were some challenges you had while working on OTGW and how did you address them? What do you enjoy doing when you aren't busy writing and playing beautiful music? Any advice on dealing with imposter syndrome and general creative walls/slumps? Big thanks to both of you for doing this AMA. OTGW is up there as an easy favourite and instant classic. I remember I (josh) broke down in tears at some point during episode 6 because I didn't think we could finish all the music in time. The cello, cimbalom, and bassoon for the entire episode was all recorded in one flurry of work on the last night before it was due. The very last piano notes when Beatrice flies away were recorded on my laptop on my home piano minutes before we had to submit the episode. That was stressful. I think trying to make something that you're proud of on the normal TV grind schedule is very difficult, or at least it was for us. After a brief review of wikipedia to make sure I knew what imposter syndrome was, I think we have a few strategies here in the studio for dealing with that (assuming I understand what it is). One is that the goal in film music is to serve the work, not to make something original or ground breaking. Also the ultimate judge of whether or not the music is working is the director, so if s/he is happy, then you can rest easy! Lastly, because of the time constraints of TV, things just have to be done at some point, even though they are not done. We have an inside joke in our studio: "How is it?" "It's fine..." "Great! Command+S, Command+P!" As far as creative walls/slumps, having other people in the studio with you really helps. Sometimes two bad ideas, when pitted against each other with argument and compromise can actually become a good idea. Something that occurred to me only last year is that a very simple musical idea that seems incredibly boring can actually become a very engaging piece of music once you start filling it out with all the instruments. The idea doesn't have to be amazing right from the beginning, sometimes the magic is in the production. Big fan of your music! What was your experience like going from a street band to working on shows in LA? How were you discovered and how did you get to where you are today? Follow up to that, have you achieved your dream or what do you hope is the next step? Combined with jalapeno, it has fueled many of our long days in the studio. What songs and who were the artists that inspired you guys to create music of your own? What were your inspirations for creating the music in Over the Garden Wall? Also thank you so much for making the wonderful music in Over the Garden Wall! Thank you! A huge part of Over the Garden Wall's music is Pat McHale's very particular taste. A lot of the inspiration came directly from him in the form of musical references. We just posted a list to enchantedrain's question above where you can browse through a lot of the artists we were listening to during the writing of the show. I know I forgot some but it should be a good start! Just want to thank you guys for not only contributing to my favorite show ever, but for writing the most beautifully atmospheric music I've ever heard. Also, what is your favorite weird instrument? I love theremins! Wow! Thank you, kindly. We love theremins, too! We wanted to use a theremin in the show, in fact we borrowed one for a bit, but then our friend, Buddy Nutt Jr. came through with some ridiculously good saw playing. We can't decide on a favorite weird instrument, but up there in our floating top 5 or so are all Harry Partch instruments, Glass Armonica, Celeste, Zither (mostly because of Third Man) and of course Cimbalom (not sure if it counts as weird but it's definitely uncommon out here, and I suppose in some way all instruments are pretty weird). We are trying to figure that out ourselves! We are still in that beginning stage where we supplement our incomes with gigs/weddings, piano students, busking, etc. Basically our hope is that if we work hard enough then someone who is making something will think of us and ask us to make the music. We don't really have other skills so if that doesn't work out it's...i guess it just has to work out? How were you selected to provide music for the show? Did Pat McHale know about you before hand or was this something you pursued? There’s such a range of genres covered in the OTGW soundtrack, from “Old Black Train” to “Tiny Star” to “The Fight Is Over” to “Forward, Oneiroi.” I was wondering what it was like working with so many styles for one project? Did you have to teach yourselves anything new or bring in other musicians for certain pieces? When will you produce an album that is exclusively 70s/80s vibes like “Tiny Star” and “The Fight Is Over”? Thanks again for the fantastic work you’ve done. I have the OTGW album on vinyl and it is one of my prized possessions. Aaaaaaand if you ever get the chance you should totally tour the east coast! Maybe during autumn...looking forward to your future work! Thanks for participating! 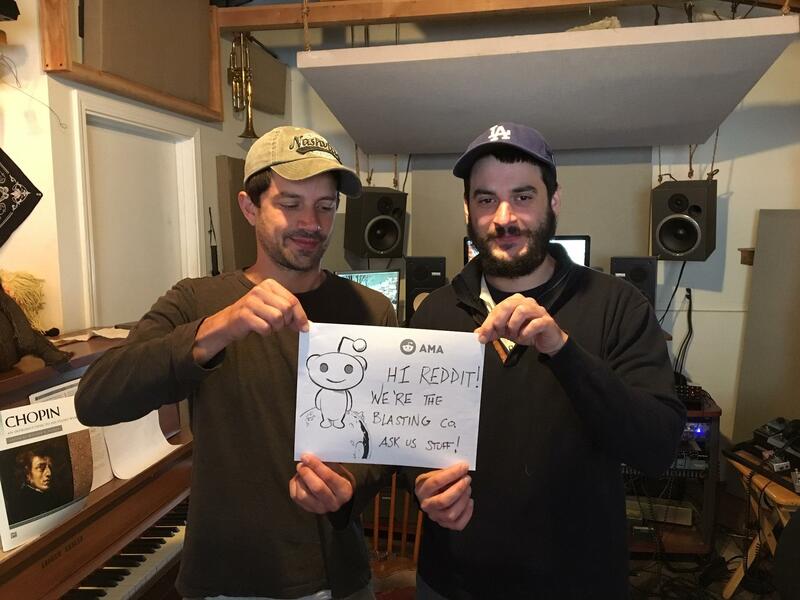 This is our first AMA and we are having a great time. We appreciate you checking out Costume Quest! It's definitely a totally different mood than OTGW but we enjoyed working on it very much and we hope you enjoy it. My understanding is that Amalia Levari, a writer on OTGW saw us performing on the street in Hollywood and bought our CD. While Pat McHale was developing the pilot, he asked Amalia if she knew of anyone who might be the right fit for the mood of the show and she recommended us. Pat sent us an email with his pitch bible attached and we sent back a "Reel" of music we had made that we felt was in the right mood. Pat liked it and let us score the pilot, and about a year later it was picked up for a full 10 episodes. We really love genre hopping and getting really nerdy about studying genres so in one sense it was very exciting to be working with so many styles. On the other hand, it was very exhausting and we definitely put in many many all-nighters to get those 10 episodes sounding decent within the TV time schedule. We brought in a lot of other musicians for all kinds of things: strings, french horn, drum programming, cimbalom, bassoon, etc. There is a full list of credits in the Vinyl release for Mondo of everyone who played on every song. We are actually working on an album right now (like...we worked on it Today!) of the Tiny Star band which we hope to have released in the next month or so. We will post it to the OTGW reddit! Thank you! We would love to tour the east coast. We will let you know when we get a chance to! I loved your work in Over the Garden Wall. I think you should all be very proud; it was clearly a labor of love. Were there any songs that were written/recorded for Over the Garden Wall that ended up getting cut? Have you ever considered releasing a songbook with sheet music for the soundtrack? I love to do covers of songs I love, but don't always have the ability to figure out the composition by ear. What was the first instrument that you each learned to play? Is that your favorite instrument, or have you since learned a different instrument that you enjoy playing more? Thank you so much for the kind words. It was most definitely a labor of love! Oh yes there were many. We actually hid a bunch of them as easter eggs at the ends of episodes in the composer's cut on the DVD. Yes we would love that! I think it might be a little bit complicated because Cartoon Network owns all of the publishing on the music, but it's definitely possible. We will look into making that happen. In the meantime, if there's anything you'd like to learn specifically let us know and we will try and at least get you a chord chart. Actually for both Justin and I (Josh) cello was our first instrument. We both ultimately gave it up unfortunately but both just now said that cello is still our favorite instrument. Brandon (the unsung hero of Blasting Company) started on trombone and his favorite is now Tuba, which he plays very well. My favorite instrument to play is piano and Justin's is trombone. I was introduced to you through OTGW, but I have since been listening to your other discography as well, and it's all fantastic! A History of Public Relations Dilemmae is one of my favorite albums of all time! Are you planning to make any more standalone albums, or are you trying to stick to other projects right now? Woah, thank you! Really, thank you. We're so glad you liked it. We've been wanting to do a follow up album since then, but we are really just now getting around to it. We've got tons of songs and ideas for songs on backlog and we're starting to flesh them out and record them. Right now, we're planning to release a 7" on a friend's label and we're working on a standalone album of the Tiny Star band that plays at the party Wirt goes to in Episode 9. We had so much fun going down the synth-pop rabbit hole with our friend Eddika Organista (of el-Haru Kuroi) that we decided to make a band. So yeah, two in the oven! Thanks again for the kind words. We'll start releasing new stuff as soon as we can! Bawwwwww. We miss him too, the little buddy. Sometimes Josh thinks he hears Greg's voice on other children's shows, like a phantom ringtone, calling to him from some unknown mmmmmmm banana nut duck bread. First, I just want to say that you're soundtrack for Over the Garden Wall is probably my favorite soundtrack period. How did you guys create the majority of that to sound so peaceful at times, happy at another, and menacing at another? And what is your guys next project? Wow that is an amazing compliment, thank you so much. Probably the biggest genius behind all the different moods we Pat McHale. He really can feel when a piece is going to communicate the mood he needs for a particular scene. Also having multiple people in the studio and trying to make a piece that all three of us agree is working for the scene is very helpful. If all of us and then Pat all agree that the music is feeling right, then it's probably feeling right! Any chance you fellows have an extended version of “Money for School”? It’s one of my favorites from the album but it ends at just over a minute and a quarter and leaves me wanting more. Gee thanks! Yeah, I guess that's one of the shortcomings of composing for particular scenes in visual media: sometimes songs don't quite get the chance to develop to their full length or musical potential. The version you're hearing is the longest one we have, and now that I'm listening to it... it really feels like it should continue on in classic march/rag form with B & C parts! Damn, I guess I'll have to wait for the live-action remake then. We've got a small inside joke when we're re-watching the series each Halloween where we'll all hold the note as long as we can on a single breath, vibrato and all, until only the victor remains. As for the recording of "Into the Unknown" -- the length of that particular note was determined by the master crooner stylings of Mr. Jack Jones himself (performed fairly consistently throughout alternate takes, as I recall). We were also impressed with his width of vibrato and sustained breath control; so glad he made that song extra interesting! OK first of all that is an amazing game, we're definitely gonna steal that. The credit for that all goes to Jack Jones and Patrick McHale! I'd have to hunt down the original sketch I (josh) sang as a reference for Jack Jones but I'm pretty sure he held it way longer when he was recording with Pat. Hey, just wanted to say this because somebody on here shared something personal and then deleted it. We wanted to get to it today and felt really bad about missing it, because it means a lot to us that a connection exists and we definitely want to honor that and take time to talk about what it means to go through a hard time and - listen - at least from our standpoint, we value that anybody would want to share things they've been through with us and we're not trying to ignore any of that. So don't delete your questions. At least not on account of us not getting to them. We intend to check back periodically and keep the responses coming. And to whoever it was, if you check back on this, we apologize for not getting to it sooner. I know it's sketchy being vulnerable, even when you can be kind of anonymous. But that's part of what all this is about, right? Anyway. Thanks for writing us, y'all. WAIT, from the Hollywood Farmer's Market?! Is that you guys? I have your album from like 10 years ago. I don't have a question, just glad to see you're still together and having success! Whattya know, I'm a legit Blasting Company hipster. "Oh, you mean the Petrojvik Blasting Company? I was into them before they got all big." Hey, are you guys playing around town any time soon? We don't have anything planned but we are down if you have any ideas of where we should! I hear a lot of Balkan music influence in your music. What are your favorite Balkan songs or artists? Also, what if is the difference between The Blasting Company and your other project The California Feetwarmers? Is the former more folky while the latter is more jazzy? Elvis Ajdinovic, Ekrem Mamutovic, Boban Markovic (esp. the old stuff), Himzo Polovina, Nada Mamula, Romica Puceanu, Gabi Lunca, Adi De Vito, Nicolae Guta, Toni Iordache, Marin Bunea, Adam Stinga...there are so many more I will post some more soon! There are actually a lot of bands in our LA musical community with many of the same members. The main difference between them all is who's creative vision is it and who is in charge. That way instead of having a big fight about the creative direction of a band, someone can just say, OK let's do it that way but will you play in MY band and we can do it this way? In general the California Feetwarmers has a strong focus on early Jazz while Blasting Company is more Balkan, but the Feetwarmers have been caught playing a Kolo or two, and BCo definitely plays Jazz now and again. Sure, you could call the California Feetwarmers our folk-jazz sibling band — 1920s, New Orleans, Trad. Jazz. The Blasting Company at the moment functions mostly as a studio band (we’ll attempt any style that is asked of us!) though we still concentrate on Balkan brass when we perform live. my questions: 1. which song is your favourite from the otgw soundtrack? why? 2. how did you get hired to write the music for the show? Your most listened to?!!! Thank you! We're delighted that you liked it so much and we're sorry if you got tired of any of it when it was stuck in your head. Not sure if we have a favorite song, like, if we're even capable of having a favorite. We definitely have a floating top 5 or 10. I think we tried answering that in an earlier question, but, for example, we just listened to The Fight is Over again so we could write the chords out for another person on here and were like geez, how could we forget to mention that one?! So, I don't think any of us really have a favorite. I will say again that Tiny Star made us want to make a whole album, so that's definitely got a top spot. For the second question, is it alright if I just copy for you Josh's response to an earlier question? I think it just about sums it as best as I (Justin) could do. Basically, we were insanely lucky and Amalia Levari is insanely cool. From Josh: My understanding is that Amalia Levari, a writer on OTGW saw us performing on the street in Hollywood and bought our CD. While Pat McHale was developing the pilot, he asked Amalia if she knew of anyone who might be the right fit for the mood of the show and she recommended us. Pat sent us an email with his pitch bible attached and we sent back a "Reel" of music we had made that we felt was in the right mood. Pat liked it and let us score the pilot, and about a year later it was picked up for a full 10 episodes. https://youtu.be/vZ_n5fAltX8 Please watch it! It’s my favorite cover of one of your songs. This guy is so talented! What do you guys think? Can I please get any form of explanation on the origins of either Princess Andy or GEORGE W. CLOONEY? Heh! Sure you can. We used to live in a school bus and play music on the street wherever we would end up. That tells you most of it, but specifically Princess Andy is an homage and George W. Clooney is, I guess.. aspirational? Princess Andy we wrote while stuck in Savannah after our bus's engine exploded. It was summer and we were hot and we were sitting on the stoop of the dilapidated house we rented with busking money and we had so much time. We wanted to write an ode to our friend Andy who owned a print shop called Maldorors. And I guess maybe we knew that Maldoror is a story about sharks, but I remember only learning that after. Anyway, everything was in the air back then and happy accidents were a daily occurrence, so Andy's song became a sailor's legend and besides, everything in it is mostly true. George W Clooney is .. I don't know what was going on. I remember I was driving the bus and Josh was playing accordion in the back and we just started coming up with a superfan song for him because he really does do a lot of stuff really well, but also because we had this half-serious daydream of one day becoming the party band for the stars (we had plans to follow Dolly Parton on tour and busk for her fans until hopefully one day she'd come out and ask us to hang out on her bus. Similar plan for getting on Oprah.) Anyway, we figured if we just kept busking and singing a love song for George Clooney, maybe he'd stumble upon us and ask us to be his party band. I guess in a way, that whole album is just a bunch of corridos about people we met or wanted to meet. Oh and we definitely knew George's middle name didn't start with W. We just needed it rhythmically for the chorus and G.W Bush was president at the time, so the little bit of misdirection felt worthwhile. Maybe there's even a hidden political message in there. I tried to think of it at some point, but eh, I'm not totally convinced. I don't know if you guys are still answering questions, but I just say Over the Garden wall has some of the best music I've ever heard. It's absolutely fantastic. My question is: will mondo ever release the soundtrack again? I wasn't able to purchase it in time and it sold out. Thank you. It's really nice of you to say. We're sorry you couldn't get an album in time. I don't know what Mondo's plan is for further releases, but they seem to keep pretty good track of interest and folks who missed previous releases. They usually give us a heads up when they're doing another release, so we'll try to keep everyone posted via social media, and on here too.